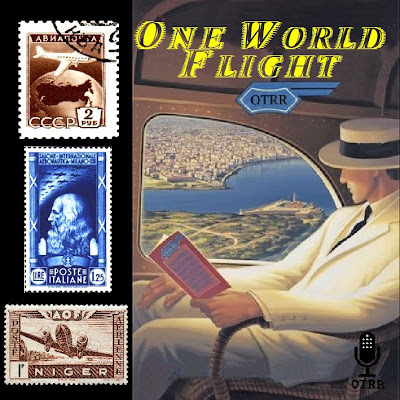 One World Flight consisted of 13 episodes which aired on CBS radio on Tuesday night from 14 Jan – 8 Apr 1947. The documentary series was produced by Norman Corwin who was the recipient of the first One World Award by the Wendell Willkie Memorial and the Common Council for American Unity. First prize was a round-the-world trip. According to Time Magazine article of Monday, 27 Jan 1947, Norman Corwin began his trip in Jun 1947. He took with him CBS Recorder Lee Bland and 225 pounds of magnetic wire-recording equipment. The trip lasted four months, covered 42,000 miles and they visited 16 countries which produced 100 hours of recorded interviews. He interviewed heads of state and common people, people of all types regardless status or walks of life. The transcript alone produced 3700 typed pages. Norman Corwin, four recording engineers and six typists took three months to develop this documentary series. Each program covered a portion of the trip and made an important contribution to the public perception of the rest of the world to help heal some of the wounds of World War II. Norman Corwin narrated, with the voices of filmmaker Sergei Eisenstein, scientist Peter Kapitza, Pravda editor David Zaslavsky, composers Aram Katchaturian, Michael Borodin, and Sergei Prokofieff; others."